A good cream of mushroom soup recipe is very versatile. It can be used as a starting ingredient for casseroles and other soups, or as a comforting meal on its own. While many people love the Campbell's version from a can, I find homemade cream of mushroom soup to be far superior. You have more control over the amount of sodium, and the resulting soup is much heartier! Some recipes will have you begin cooking the mushrooms directly with the liquids. I think they absorb the flavors much better if they're sautéed first. For detailed instructions on how to do this see the how to sauté mushrooms page. The use of heavy cream here keeps the soup from curdling, although it doesn't do your waistline any favors! For a lighter soup you can substitute olive oil for butter, and half and half or a lower fat cream for the heavy cream. Be aware that you may get a chunkier texture if you don't use heavy cream. 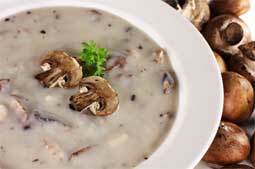 If this creamy mushroom soup sounds too heavy try a mushroom barley soup recipe. Mushroom barley is equally hearty and delicious, and a lot healthier. Recommended mushrooms: Cremini mushrooms but white buttons, oysters, or shiitake also work well. You can even get a little fancier and use gourmet mushrooms such as morels, chanterelles, black trumpets, or porcini. Clean the mushrooms with a damp cloth and slice them into medium-sized pieces. Chop the onion as well. Heat the butter over medium-high heat in a large pot. Add mushrooms and lightly sauté for about 3 minutes. Add the onion pieces and cook with the mushrooms until the onion is soft, about 10 - 15 minutes. Next add the lemon juice, broth, and flour. Whisk until the flour has blended in smoothly with no lumps. Slowly add the cream while stirring constantly. Only pour in 1/4 cup of cream at a time and don't stop stirring. This helps to make the soup smooth rather than clumpy. Bring the soup to a simmer (not an outright boil). Stir constantly while simmering until the soup has thickened. If you like, you can wait until the soup has cooled a little and purée it in a blender or food processor. This will result give it a much smoother consistency. I prefer to just serve it warm and chunky with some bread! Add some herbs or spices along with the broth. Popular choices are thyme, a bay leaf, nutmeg, basil, or oregano. A little of these spices can go a long way so only add 1/8 to 1/4 tsp at a time. Many people love the taste of 1/2 cup sherry or white wine in the recipe. Make a fancier cream of mushroom soup recipe by adding about 1/3 cup dried gourmet mushrooms such as porcini.